A van driver suffered head injuries after colliding with a tree along West Coast Road on Dec 31. A video of him sitting unconscious in the van was taken by Stomper Ahmad, who was walking back home at that time. He told Stomp: "I heard a loud bang as I was walking and turned around. "I saw the van and a group of people by the van. "I joined the group and saw the unconscious driver in the van. "I took out my phone and started filming the incident. "The van was badly smashed and I think the part of the vehicle impacted the most, was near the driver's seat. "The van was badly dented in that area." 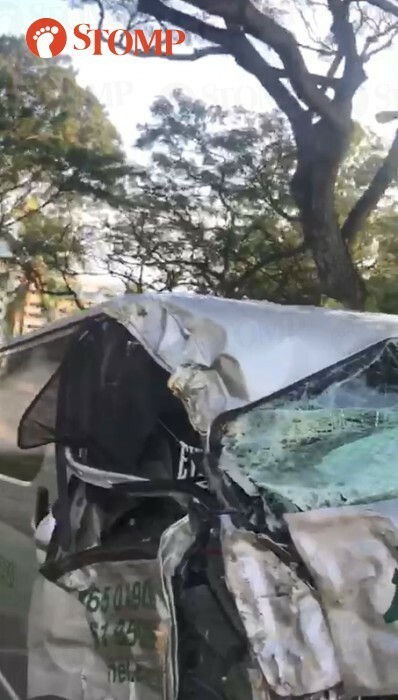 In response to queries from Stomp, the police said: "On Dec 31, 2018, at 7.56am, the police were alerted to an accident involving a van along West Coast Road towards Penjuru Road. "The driver, a 31-year-old man was unconscious when conveyed to National University Hospital." Stomp understands that the driver lost control of his van and as a result crashed into a tree. The van driver suffered a head injury. In the three-and-a-half minute video, the van driver is bleeding from the forehead, while his left arm is hooked through the steering wheel. The front and right window of the van is broken and shards of glass can be seen around the driver. The door to the front passenger seat of the van is open wide as a group of three to four men lean into the van, shouting and trying to wake the driver up. In the background of the video, the men can be heard calling out to the van driver. One of them says: "The ambulance is on the way." The men seem to be trying to find a way to get the van driver out of his seat, however, the door to the driver's seat is smashed badly. "His hand is broken. I'm scared something will happen," a man exclaimed in Malay. Midway through the video, the van driver moves his forward. His eyes are closed and he does not respond to the shouts from the men. He puts his head on the sun visor in front of him, leaving a trace of blood behind. A man in the background says: "He is still holding on to a cigarette."